about three friends on a 170 mile bike trip. Staying friends should be easy. But then, so should growing up, and George, Harry and Ian have never really got the hang of that either. They spent their twenties in a state of permanent childish abandon. Now, adulthood is catching up with them and the icy blast of work, commitments and relationships is beginning to take its toll. 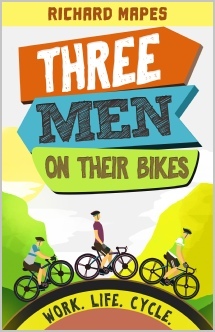 In one last ditch attempt to keep responsibility from eroding their friendship entirely, the trio decide to take a cycling holiday across the breadth of the country. Which would be fine if they'd ever cycled before. Or if George's idea of modern cycling wear wasn't tweed, long socks and cycling clips. "This is a young man version of Last of the Summer Wine, but these are graduates, challenged by technology, officious railway personnel, bicycle clips and brightly coloured Lycra. They encounter cramped hotel rooms and sober women cyclists. They argue the merits of padded shorts over checked trousers belted above the calf. Short cuts and gut instincts sometimes win over GPS and Google searches. Their friendships and stamina go through the pain barrier in the hills and valleys of The Penines, and none are quite the same at the end of the journey." "The book is a delightful read." "At times comical, and at other points contemplative, this is a good story. "There's all the time in the world. The only thing that changes is the number of choices you have on what to do with it." I agree and I highly recommend this book." "It captures the spirit of hiking/cycling tours and having some healthy fun." "What a joy it was to read."